When it comes to consumers, a company cannot bank on its trustworthiness. In fact, businesses are now expected to up their game to “trustability,” a term recently coined to describe a proactive approach to customers. So how do businesses gain “trustability?” Even if it is not acknowledged, businesses have a tendency to kick the term transparency and authenticity around. Yet, in this new era of trustability, there are no workarounds. Regardless of industry silo, it is imperative that businesses put their money where their mouths are, literally, and build stories around content that speaks to transparency and can help to fortify relationships. One key area where consumers have become leery is personal data collection. Businesses can overcome trustability issues by being clear about the types of information being collected and how the data are being used. 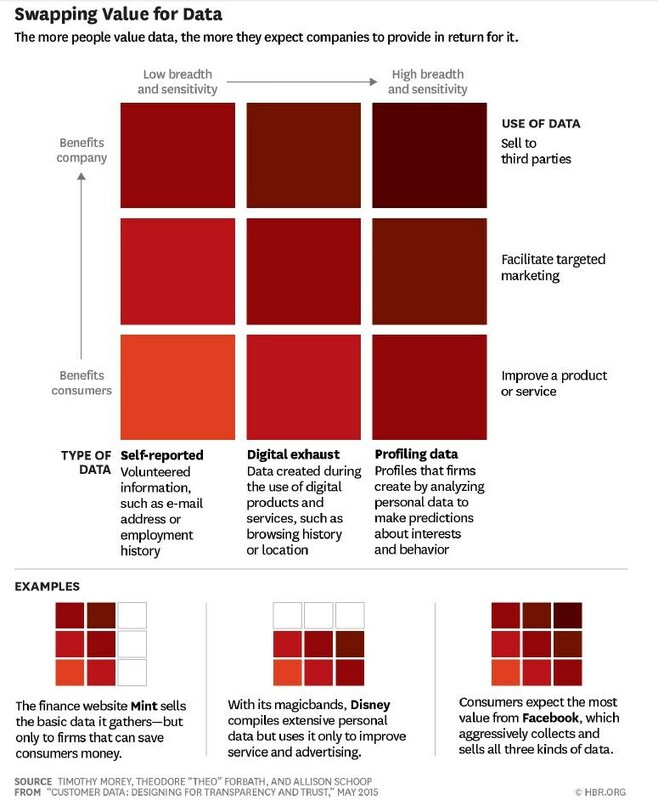 Recently, frog design examined three categories of data collection to evaluate how people assigned importance to the information being collected: self-reported data (e.g. e-mail addresses, age and gender); digital exhaust, (data created through mobile device, web service, or other connected technology usage such as location data and browsing history) and profiling data (customer profiles or personas created to predict someone’s potential behaviors or interests, and based on self-reported, digital exhaust, and other data). The findings demonstrated a clear escalation in how consumers valued the information that was being collected (and that they provided), with self-reported data at the bottom, digital exhaust in the middle, and profiling data at the top. The implications are important: extreme trust requires fair value in exchange for the provision of data. Today’s consumers are more socially conscious, with millennials in particular engaged in some sort of activism. To these younger consumers, where a company procures its ingredients, how it supports sustainability, and where and how it manufactures its products matters. As noted in Deloitte’s Consumer Product Trends, Navigating 2020, some consumers are placing greater emphasis on a product’s impact on health, the absence of artificial ingredients, or its start-to-finish environmental footprint. Other consumers are more focused on how a product impacts a community’s overall well-being and its inherent social values, such as “green,” “local,” and “back to nature.” Companies are experiencing greater pressure to better align offerings and activities with these consumer interests and values. As Michelle Linn of Content Marketing Institute states, “People want to buy from brands and people who are relatable and trustworthy. By sharing what works – and what doesn’t – as well as building stories around these experiences — the audience feels part of an authentic experience.” She describes a scenario where trustability takes front and center stage, demanding that companies step out of their comfort zones. Trustability means that companies must demonstrate that they are open to consumer feedback and dedicated to truly improving how and why their customers buy their services or products. Trustability requires content that is truthful, finds a perfect balance between revealing too much or too little and extreme exaggeration. Even the hint that a company is hiding something or not being transparent in its exchanges can cause irreparable damage. Trust matters. Trustability matters even more in today’s ever fast-paced, consumer-focused world.